at extreme”, a visit to their place will surly get your moneys worth. as Sidhu and Baba Tilka Majhi were part of these enthusiastic tribes of India. Santhali is the prime language spoken by the Santhal Tribe. This Indian tribe also have a script of their own called Olchiki. Apart from Santhali they also speak Bengali, Oriya and Hindi. 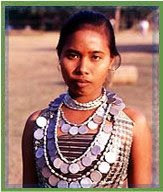 The Santhal tribes of India have a typical tribal lifestyle. Basic needs are fulfilled by forest tress and plants. The tribes are also engaged in fishing and cultivation. These tribes of India also poses a magnificent skill of making musical equipments, mats and baskets out of the plants. The way this articulate process is carried out is worth wathing. Dancing and music are the streamline of these Indian tribes. Santhal women dress in the red bordered white sari and dance in the line sequence. These tribes in India play mind soothing music with instruments like Tirio, Dhodro banam, Phet banam, Tumdak, Tamak, Junko and Singa. Ironically, Santhals don't have a temple of their own and neither do they worship any idols. These tribes of India follow the Sarna religion, with Marangburu, Jaheraera, and Manjhi as their god and goddess. Santhals pay respect to the ghosts and spirits like Kal Sing, Lakchera, Beudarang etc. Animal sacrifices in order to appease the Gods is a common practice amongst these energetic tribes of India. Karam festival which falls in the month of September and October, is the highlight festival followed by tedany visitor trevelling to these tribes in India. Other festivals of the celebrated include Maghe, Baba Bonga, Sahrai, Ero, Asaria and Namah. 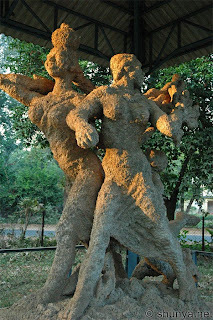 They also celebrate haunting festival called Disum sendra on the eve of Baishakhi Purnima. The photo you showing is not a phot of Santhal tribe please be factual. photo is not factual as well as there are many mistakes in names of the festivals. photos shown in the article are not of santhal tribe. Sarna is not Santhals religion at all.Some educated those taught in different Indian philosophy particularly those influence by ORAON and MUNDARIs may have been trying to get the Sarna as the Religion of Santhals. But the majority of Santhals in India practice the same culture,Religious and Rituals in the name of 'SARI-Dharam.Santhals of Orissa(a Segment), Jharkhand( of Singhbhum areas)mainly call their Religion 'Sarna' to be a part of Mundari and of Oraons religion.Although they all practice every rituals,etc. following the oldest religion the 'SARI-Dharam'Please correct. u shud put more information on santhal tribes' lives and their culture and traditions. pls . elaborate its a request and provide us more pictures on their food or anything else. This information help me a lot for my Social Science project. Thank You very much! !